Fighting aging with Vitamin C! Time has come for me to really get into anti-aging skincare... Having reached the respectable age of 35, I've noticed more fine lines and lack of firmness in the past few month. I'm trying to build an anti-aging routine that will work with my combination skin, which has been prone to more breakouts lately. Vitamin C is a major player in anti-aging skincare: it is known to reduce discoloration like sun spots, brighten skin, and also to stimulate collagen production, which helps maintain skin's firmness. It is also a powerful anti-oxidant, a type of substance that helps protect skin against the damage caused by free radicals. I was sent the Vitamin C Serum for consideration by Radha Beauty, a growing brand that has a small range of cruelty-free, made in USA natural skincare carefully formulated without harsh chemicals. My first thought when I received it was that the packaging looks like something I could buy at a department store. Radha Beauty may be a small brand but the bottle the Vitamin C Serum comes in is both sturdy and luxurious. It is an opaque and air-tight container with a pump, which is tremendously important with this type of product, as vitamin C is fairly unstable and quickly degraded by air or light. The serum is completely liquid (just a tad bit heavier than water), clear and fragrance-free. Fragrant substances, whether chemical or natural, tend to be irritants so it's always better for your skin to use fragrance-free products. I use 2 pumps, trying not to push all the way down the second time, to treat my entire face, neck and décolleté area. Because it's a liquid, I pump it into the palm of my hand rather than onto the fingers (it would drip through), then I rub my hands together and apply with wide sweeping motion. It feels sticky on for a minute or two, and then gets fully absorbed without leaving any residue on the surface of the skin. I follow with my regular moisturizer, which as I have noticed gets absorbed better and faster when used after the Vitamin C Serum. I have a heavier moisturizer that I'm trying to finish (because I don't like to waste! ), which tends to leave my skin super shiny. When I use the Vitamin C Serum first, I look noticeably LESS shiny though. I'm not sure what in the serum causes that but this is a great side-effect! This product feels gentle, it never stung or made my skin uncomfortable in any way. I use it every morning, and I feel like my skin has a youthful glow that I hadn't seen in a while. I definitely look less tired and dull. I've always had freckles, and I'm perfectly happy with them, but I have started seeing sun spots in areas where I never had freckles before, like my chin and forehead, since I moved to always-sunny San Diego. Hopefully, this product will help keep them in control. It takes a while for vitamin C to have a visible effect on over-pigmentation so I'll have to be patient, but I'll come update this post after I finish the bottle. Overall: this is a great addition to my anti-aging skincare routine. I love the packaging, the fact that it's not tested on animals, and the powerful ingredients. 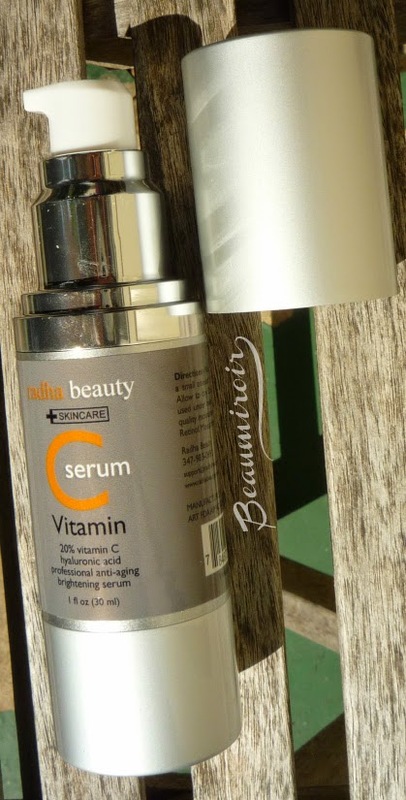 At this price (under $23 on the brand's website), it's also one of the most affordable vitamin C serum on the market! Where to buy? on Amazon here. You can also check the Radha Beauty's website here. The product featured in this review was sent to me by the brand for consideration and review. I received no other compensation to write this post, which only reflects my personal opinion. This post contains affiliate links.